Nigel ventures South and experiences all phases of the craft beer revolution in America. In retrospect, “swinging by” Asheville, NC on our way to Charleston, SC after three days in the Smoky Mountains was not the best of planning. Spending less than 24 hours in a city with 18 craft breweries, a thriving alternative culture, and one of America’s most famous attractions in the Biltmore Estates is much like a family with young children stopping by Disney World for an hour on their way to Miami. It’s a tease and you end up wondering when and if you’ll be able to return again to fully experience it. Knowing this would be a quick stop, we had each packed an overnight bag in Gatlinburg, which joined the cooler and the laptop with us in the hotel while the remainder of our two weeks’ worth of stuff stayed locked in the car. This visit was all about beer … no lounging around the hotel, no sightseeing tours, no fancy dinners. Beer. That’s it. After an hour at the hotel for a quick nap and a quick change, we were off to the lobby to hail a cab and begin our Asheville adventure. Getting a cab proved to be more challenging than expected, but once we finally got one we found the driver to be pleasant. We had reluctantly decided on Asheville Brewing Co. as our first destination, as their downtown brewpub appeared to be near the center of a brewery district. The driver picked up on our hesitation to name a destination and asked if we had heard of Wicked Weed. He referred to it as an “apparent hot spot” and said the food was good as well. If there was ever proof as to why it’s wise to listen to the locals when travelling in an unfamiliar place, this was it. Asheville Brewing was only a few blocks to the west and we ended up there towards the end of the evening anyway, but the tone set at Wicked Weed got our evening off to the perfect start. 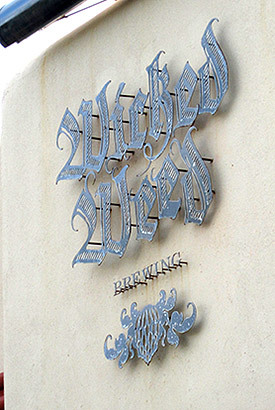 Wicked Weed opened in December 2012, making it one of the newer entries in the Asheville scene. The brewpub is located in a typical Asheville neighborhood, very blue-collar with buildings that have been there for many decades. Wicked Weed’s location was most recently a hardware store, although you wouldn’t know that based on appearance. Completely remodeled, it looks new both inside and out. The bustling crowds on a Wednesday night in April would seem to attest to the popularity of Wicked Weed, as would the news from August that they’re investing at least $5 million to start a production facility on the outskirts of Asheville. With the brewpub packed upon our arrival shortly after six p.m., we chose to brave the 60 degree North Carolina evening and sit on the large street-level outdoor patio. The menu was small but focused, with the central theme being American brewpub fare with a twist. We had an outstanding calamari appetizer that was well seasoned and paired perfectly with our beer of choice, Freak of Nature Double IPA. The better half enjoyed a delicious Greek-inspired burger and I had the meatloaf that was made with Carolina-raised bison rather than beef. The portions were just right, the service was friendly and speedy despite how busy the restaurant was, and the food was just as the cabbie had said … outstanding. Most importantly, the Freak of Nature DIPA was world-class. Given how busy it was and how chilly the spring air was becoming as dusk drew closer, we chose to depart Wicked Weed after our meal and one Freak of Nature each. A quick run to the restroom further demonstrated just how popular—and large—the brewpub is. The server stated the restrooms were through the large restaurant/bar on the main level and down the stairs. Once I got the base of the stairs … surprise! Another bar, more seating, and another outdoor area awaited. This was apparently a bar-only section (no food), but again was packed with customers. We navigated our way through the crowds and departed Wicked Weed, the evening still young, our stomachs full, and the lingering bitterness of hops still on our tongues. Our cab ride to, and dinner at, Wicked Weed had allowed us to further research Asheville breweries, and while we’d have been more than happy to take a cab all over town if necessary, we were in the perfect spot to take a walking tour. Within a short radius of Wicked Weed were five more brewpubs, so we headed south a few blocks along Lexington Avenue towards Green Man and Burial Beer. Green Man was up first and turned out to be a wise choice as we soon discovered that Burial, which was half a block further south, was closed for the evening. With the lights of McCormick Field, home of the single-A Asheville Tourists shining in the distance, we entered Green Man and ordered our second pint of the evening. The ambiance at Green Man turned out to be much more reminiscent of the Asheville we would come to know than Wicked Weed was. Like Wicked Weed, it was in a repurposed building, but unlike its neighbor to the north, the remodeling was much more modest. Opened in 1997, it’s among the oldest brewpubs in the city and clearly one of the most respected. We entered to a small bar and a few high-top tables, with the production brewery visible in the background well behind the bar. We didn’t realize it at the time, but the garage door next to the regular door is an Asheville brewpub staple, and it was open on a mild spring evening with the ballgame in the distance. We bellied up to the bar and were immediately engaged in conversation with some locals who noticed my Milwaukee Brewers cap and felt the need to point out they were Chicago natives and Cubs fans. However, they were friendly and we had a nice 15 minute talk about the Midwest, the reason they moved to and loved Asheville, and why the Brewers were the best team in baseball (come September, that would have been an entirely different conversation). The better half ordered a pint of Green Man IPA and I ordered a beer called Red Barchetta, which was an Imperial Red brewed with Chinook hops. Saying goodbye to our new friends but with our pints still full, we exited to the side of the building where there was a modestly sized outdoor area covered by a pergola and hop vines. A vacant, homemade bar and picnic tables provided ample seating. One other group was in the outdoor area and they left not long after we entered, so we enjoyed a solitary spring evening sipping our delicious beers and discussing how nice Asheville seemed thus far. The Red Barchetta was legit, a delicious and complex beer that was apparently a one-time only brew that I consider myself fortunate to have had the opportunity to sample. The better half enjoyed her IPA as well. With the sun hanging low in the sky and enjoying our spot at Green Man, we debated sticking around for another but knew that brewpub hours tend to be much earlier than bars, so we reluctantly departed in search of the next stop. My phone indicated that a half block west and about a block north was another brewery called Twin Leaf, and a little further beyond that was both Hi-Wire and the Asheville Brewing Co. we originally planned to start at. We had some conflicting info on the actual existence of Twin Leaf, but we gave it a shot since it was on the way to other potential stops. Seeing dogs napping under the picnic tables and standing proudly at their owners’ side while they enjoyed a pint was certainly a new experience for us. With a gorgeous dusk glow upon us, we walked north up the hill on Coxe Avenue toward the heart of downtown, and the building that claimed to be Twin Leaf appeared abandoned on the avenue side. However, the better half noticed that there was an open garage door along the side-street and some folks and dogs mingling about. With signage hard to spot, I had no clue what exactly we were looking at. We approached somewhat slowly and were met by some friendly people with beer in hand. A peek inside found quite a few picnic tables and a homemade wood bar along the back wall. Once again, we were in an Asheville brewpub. Twin Leaf is the newest entry in the Asheville scene, with our visit on April 30 coming shortly after their March 8 debut. The exterior of the building may have been somewhat dilapidated, but the interior was nicely remodeled and bustling with guests as the clock hit eight p.m. The walls of the brewpub were erected to separate it from the remainder of the old industrial building and brewing equipment. The centerpiece was a reasonably sized wood bar with pub chairs surrounding it and a solid wood wall behind it with chalkboards displaying what was on tap. 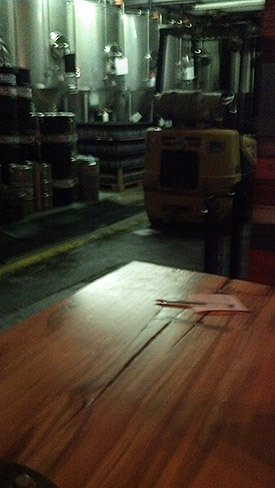 The remainder of the brewpub had simple concrete floors with wood picnic tables, with a view of the sparkling stainless steel brewing equipment in the background. Most guests were seated at the picnic tables, which is where we settled in after ordering our first pint. I ordered the 144 IPA, a reference to Twin Leaf’s address at 144 Coxe Avenue, and the better half ordered the Dark Matter Stout, an oatmeal sweet stout. Both were enjoyable, but neither really stood out. I had a second pint, taking a risk relatively early in the night with a potent Belgian Trippel called Luminosity. Once again, it was a solid take on the style but far from an elite version. While the beer was fine, Twin Leaf stood out for a couple of other reasons. First and foremost, it was a dog-friendly brewpub. Seeing dogs napping under the picnic tables and standing proudly at their owners’ side while they enjoyed a pint was certainly a new experience for us. We enjoyed the canine company but also began to miss our loyal Beagle-German Shepherd mix that was waiting patiently for us back home. Secondly, though only in business for a few weeks, Twin Leaf appeared to have a strong, loyal following. The pub was packed and many of the guests appeared to be regulars. It seems impossible to have “regulars” a few weeks in, but whatever Twin Leaf was doing appeared to be working. Customers and dogs alike appeared to be satisfied and having fun, which is a great sign for a new business. We spent about an hour at Twin Leaf, departing shortly after nine p.m. We next headed towards Hi-Wire Brewing, about a block and a half to the northwest. With darkness now fully upon us and once again not knowing how late the brewpub would be open, we expected that we’d find Hi-Wire nearing close. Fortunately it was still open and we entered through—you guessed it—an open garage door and bellied up to the bar. In the middle of the action at Hi-Wire. Hi-Wire is another relatively new entrant to the Asheville scene, with our visit coming just shy of a year after the taproom opened. Like Green Man and Twin Leaf, Hi-Wire is housed in a repurposed industrial building that is modestly remodeled. Also similar to the previous two stops, the bar is in the brewery proper, though this time to the extreme. The small custom bar sat about a dozen people, with the remainder of the brewpub essentially in a small corner of the brewery. There were a few high tables with bar stools, a small drink rail along the walls, and restrooms. The production brewery was fully visible and only a few feet to the left of my seat at the bar was a mountain of cast aluminum barrels, a forklift, and a concrete floor with a drain running the length of it. I was surprised we weren’t required to wear goggles and a hard hat given how close to the facility we were. We both ordered a pint of Hi-Pitch IPA and were soon engaged in conversation with a gentleman that once again noticed my Brewers cap. He was a local baseball coach and was an acquaintance of a Brewer from the late ’80s, so we had plenty to talk about. Much like the couple we had met at Green Man, we discussed Asheville’s beer and unique culture, the Midwest, and of course shared some excellent baseball stories. Our new friend was a regular and knew the young lady tending bar, so she joined the conversation when not occupied pouring pints. We found her to be quite friendly, very knowledgeable about beer, and dialed in with the culture of Asheville. She even gave us a couple of restaurant suggestions for lunch the next day. We stuck with the Hi-Pitch IPA at Hi-Wire and had a few pints as the conversation was excellent and the atmosphere exactly as we had hoped. In retrospect, I regret not sampling any of their other offerings as there were about seven on tap as well as a few guest taps from other Asheville and national brewers. Hi-Pitch was a solid IPA, somewhat reminiscent of Green Man’s version we sampled earlier in the night. Crisp and clean with a decent hop profile, we enjoyed our pours but enjoyed the atmosphere even more. With the clock approaching 11 p.m. and Hi-Wire nearing closing time, we thanked our new friends and departed for the next stop. Looking back, Hi-Wire would be our favorite stop on our whirlwind Asheville brewpub tour. Given the hour and the fact it was a Wednesday, we knew our options would be limited upon departing Hi-Wire. The only brewpub remaining on our spontaneous walking tour was Asheville Brewing Co., and fortunately for us, they were open later than most of the others. Located about a half block from Hi-Wire, we entered a different world as we approached. Unlike the previous stops, it was in a modern building that had a standard restaurant/brewpub atmosphere. We stuck with the Hi-Pitch IPA at Hi-Wire had a few pints as the conversation was excellent and the atmosphere exactly as we had hoped. Asheville Brewing is the oldest of Asheville’s craft breweries, founded in 1995. The facility we visited on Coxe Avenue is the second location and it houses the production facility as well as a full-service restaurant/pizzeria. Asheville Brewing also has a third location on the outskirts of Asheville and appears to be poised for further expansion. The production brewery was not visible from the bar and the restaurant was virtually empty given the hour. We again sat at the bar and both ordered the Shiva IPA. Unlike previous stops, we were not engaged in conversation with the locals and the atmosphere was very antiseptic. There was an NBA playoff game on the TV in the corner, so we sipped our beers, watched some basketball, and planned our next move as we quickly realized it was going to be a brief stop. Chalk it up to the day and hour we were there, but the ultra-hip, fun-loving vibe we’d had at our other four stops was non-existent at Asheville Brewing. We departed Asheville Brewing just before midnight, ending our brewpub tour of Asheville but not yet ready to end our evening. Given our proximity to downtown, we decided to walk north and see what we could find for pubs. A couple of blocks due north of Asheville Brewing we discovered Jack of the Wood Public House, which featured the logo of Green Man on the outside. We entered to find the bar relatively busy and a decent selection of taps, including quite a few from Green Man. Jack of the Wood advertises itself as the “original home of Green Man ales” and had five Green Man offerings on tap. It was a perfect end to the night, as our previous regret that we hadn’t spent more time at Green Man was tempered by a fresh pour of Green Man IPA and a relaxed, comfortable atmosphere at Jack of the Wood. Given our location, it was also an excellent spot to hail a cab. After a couple of pints at Jack of the Wood, we did just that and headed back to the hotel shortly after one a.m., comfortable in our belief that our Asheville beer tour was a resounding success. We arose the next morning a little bleary eyed, but a mild headache and touch of cotton mouth was well worth the price of admission. We arose the next morning a little bleary eyed, but a mild headache and touch of cotton mouth was well worth the price of admission. We showered up, rehydrated, and checked out of the hotel that we spent virtually no conscious time in. We stopped for lunch at a Jamaican restaurant recommended by the bartender at Hi-Wire, which proved to be outstanding. Despite a four-hour drive to Charleston ahead of us, we headed downtown to tour some of the shops and galleries of Asheville for a few hours. Much as our brewpub tour had been the night before, the shops and galleries were incredibly unique, the people exceptionally friendly, the dogs plentiful, and the city itself a true jewel tucked away in the heart of the Appalachians. After a few hours walking the downtown area, we made one final beer-centric stop. Bruisin’ Ales is a craft beer shop with a national reputation second to none. We were impressed with Appalachian Vintner the day before and while Bruisin’ Ales is smaller, it proved to be well worth the hype. Focusing only on craft beer, without any macros, wines, or liquors, Bruisin’ Ales was unlike any beer shop we’d ever been to. Located in a nicely remodeled storefront on the edge of downtown, they have clearly worked hard to earn their much-deserved reputation. Single bottles and hard-to-find selections were the focus, as were plenty of offerings from Asheville and various other Carolina craft brewers. We made quite a haul at Bruisin’ Ales, not only to provide treats for the remainder of the trip but plenty to bring back to Wisconsin. In December, Bruisin’ Ales announced they would begin shipping and opened an online shop, something we’re sure to take advantage of in the near future to get a taste of the Asheville beers we remember so fondly. We couldn’t have understood the depth to which craft beer plays a role in Asheville had we not visited. I vividly recall the first time I read about Asheville being named “Beer City USA” in Charlie Papazian’s now defunct poll. Like any proud Midwestern craft beer lover, I found it hard to fathom that a city in North Carolina hidden away in the Appalachian Mountains could possibly beat the likes of Portland, San Diego, Denver, Milwaukee/Madison, Grand Rapids, etc. After visiting Asheville, it quickly became clear that it is in fact a worthy title holder for “Beer City USA.” We couldn’t have understood the depth to which craft beer plays a role in the city had we not visited. It’s everywhere, from the brewpubs to the bars, from the shops to the day to day conversations with strangers on the street. Craft beer is to Asheville what coffee is to Seattle, what wine is to Napa, what milk is to Wisconsin. It’s everywhere, it’s part of the culture, and it’s legitimately top-notch. While we could easily look back with regret that our Asheville stop was so brief, that we didn’t get a chance to spend more time in or visit more of the brewpubs, that we didn’t see more of the shops and galleries, that we didn’t get to visit Biltmore, we both consider it a resounding success. In a way, trying to squeeze it all in 24 hours is a key part of our story, and we did a pretty good job experiencing as many aspects as possible in that short time frame. We will always remember not only the outstanding beer we drank, but the unique culture and the generosity of the people we met. It was hard to leave, and we felt right at home thanks to the kindness of the natives. But depart we did, on our way to the coast and our final two stops: Charleston, South Carolina and Savannah, Georgia.